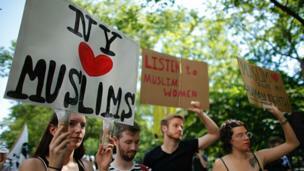 In cities across the US, people turned up to protest Sharia law - and were the target of counter protests. Protesters held rallies in cities across the US over the weekend to denounce Sharia law - an Islamic code that protest organisers say is threatening the American way of life and Constitution. The protests took place in New York, Chicago, Boston, Seattle, and Denver - where this picture was taken - as well as other smaller cities. 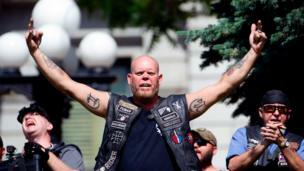 Among the anti-Sharia protesters were bikers, white supremacists and members of the Oath Keepers militia. 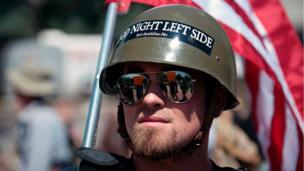 They were organised by ACT for America, which calls itself a "grassroots national security organisation". Critics of ACT say it is using a distorted characterisation of Sharia to stoke fear about Muslims in the US. The Southern Poverty Law Center defines ACT a hate group and “the largest grassroots anti-Muslim organisation in the country". 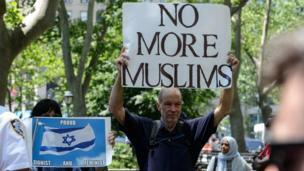 One banner held up at a demonstration in New York's Foley square simply read "No more Muslims". Critics say the protests are fuelled by racism and anti-Muslim hatred. The anti-Sharia protesters were met, and in many cases outnumbered, by counter-protests. 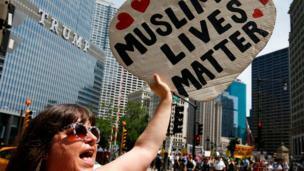 In front of the Trump building in Chicago about 30 people demonstrated against Sharia and shouted Donald Trump slogans. About twice as many counter-protesters chanted and waved placards on the other side of the street. 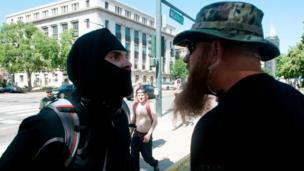 Among the counter-protesters were members of anti-fascist group Antifa, which has clashed violently with Trump supporters at recent rallies. The groups taunted one other across police lines in Denver on Saturday, leading to several fights and four arrests. 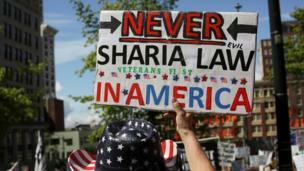 Protest organisers say Sharia is threatening to supplant the US Constitution. In reality, Sharia refers to a broad set of guidelines or principles governing various aspects of life, including marriage, family disputes, and religious observation, and is not poised to replace US law anywhere in the country. According to the Council on American-Islamic Relations (CAIR), the country's largest Muslim advocacy group, anti-Muslim incidents rose 57% last year across the US. CAIR staged a number of educational events on Saturday in an attempt to counter the message of the anti-Sharia protesters.